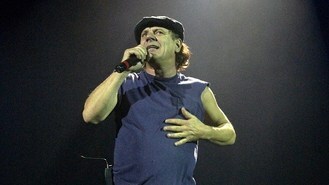 In a rare and unusual mix of rock legends, AC/DC lead singer Brian Johnson has made a surprise appearance at Billy Joel's concert at New York's Madison Square Garden and played the metal band's classic, You Shook Me All Night Long. Joel introduced Johnson about halfway through the concert, saying Johnson was part of one of the best bands he had ever seen live. The packed arena erupted when Joel and his band began playing the rock anthem with Johnson on lead vocals. The show was part of a series of concerts by Joel at the Garden. He is playing there monthly as an artist-in-residence. Friday's show included a mix of Joel standards such as Uptown Girl and Big Shot as well as less-played songs, such as The Ballad of Billy the Kid.